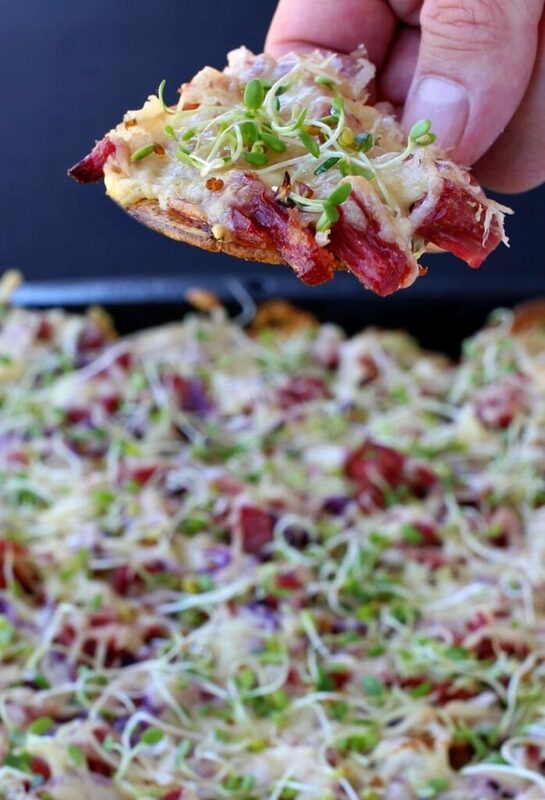 Corned Beef Irish Nachos are a super tasty way to use up leftover corned beef! Crispy potatoes stand in for the chips in this nacho recipe! Making Corned Beef for St. Patrick’s Day? Make extra so you have enough to make this epic nacho recipe! 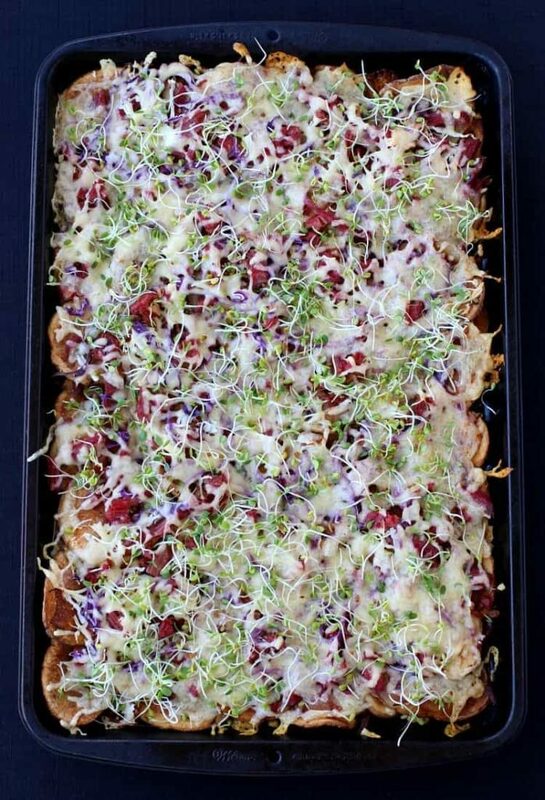 If you have leftover cooked cabbage you can throw that on these nachos, too! So what are Irish nachos you ask? Good question because I had the same one. I thought they were just regular nachos with “Irish” toppings…you know like corned beef, potatoes, stuff like that. I mean, it sounds good to me. But then I found out that Irish Nachos are actually made from potatoes – the chips are potatoes, not tortilla chips. Well now I was interested. I saw a lot of different versions of Irish Nachos on Pinterest, using potatoes for chips, but then the topping were more like a traditional nacho topping. 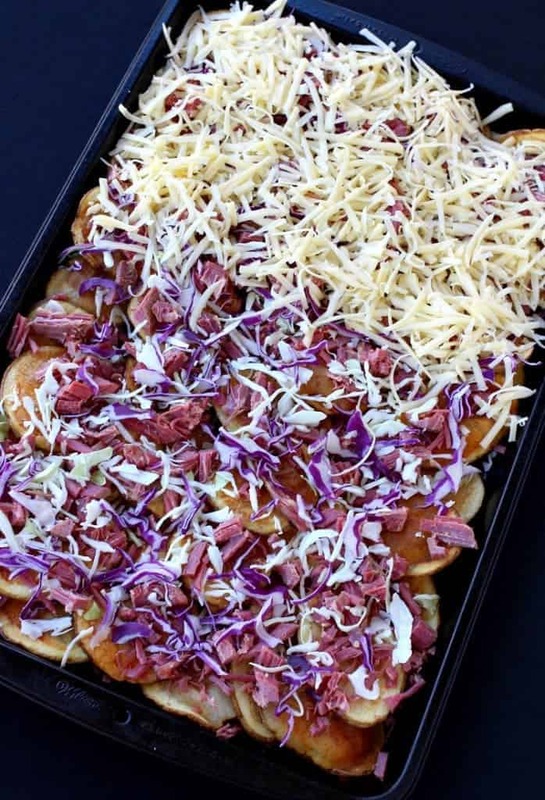 But I wanted to make my Irish Nachos to have Irish flavors too, not only for the taste but so that you can use up all your corned beef leftovers from St. Patrick’s Day! How Do You Make Irish Nachos? Getting the potato chips sliced thin and frying them up until they are crispy is an important part of this recipe. 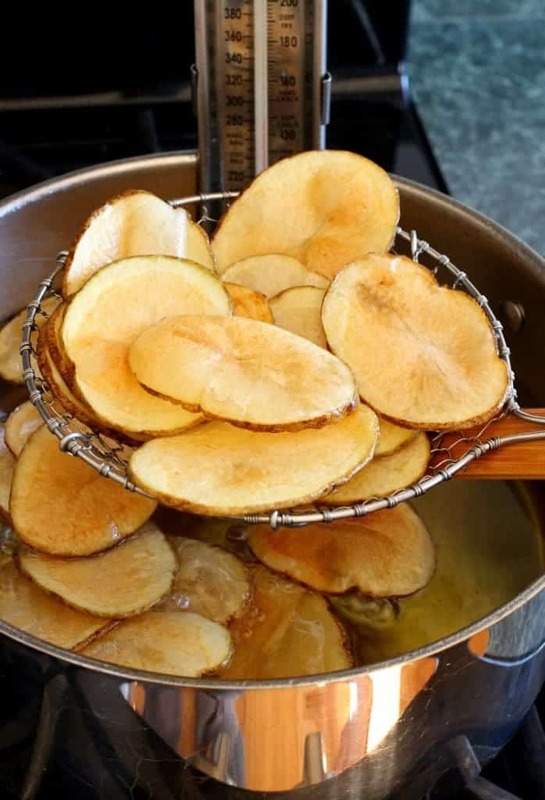 If you’ve never made homemade potato chips at home you’re in for a treat! Definitely make the homemade potato chips – but if you really, really didn’t want to you could grab a bag of thick cut potato chips from the store and use those as your base. But please, just make the potato chips, it’s SO worth it. After you are done slicing and frying your potatoes, let them drain, season them with salt and then you can start to load on the toppings. You absolutely can. So you might be wondering this since the corned beef is already cooked, and we’re cooking it again. But never fear since we’ve started out with the perfect corned beef recipe to begin with. Been there done that. So we love using this Crock Pot Corned Beef Recipe because it comes out perfectly every time. Still in tact enough to slice, but very tender. Now, if you want to make this nacho recipe for your St. Patrick’s Day party and you don’t have leftover corned beef (yet) you can just grab some right at your deli counter. Bake and top with these cool sprouts I found for an extra crunch on top. Also because it’s something green for St. Patrick’s Day…but the fresh bite of the sprouts on top definitely works. 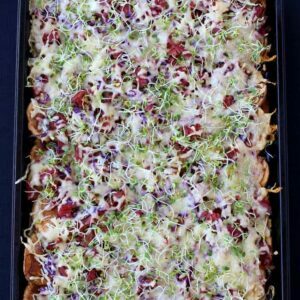 Grab a green beer or two and get these Corned Beef Irish Nachos in the oven for your St. Patrick’s Day party! Or have another party the next day with all your leftovers! 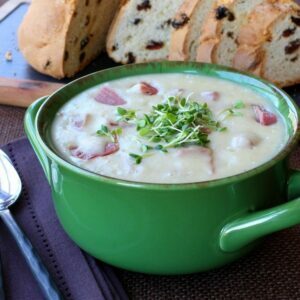 This corned beef recipe is just ONE of the many leftover recipe we make after St. Patrick’s Day! there’s so many to choose from, we always seem to have a party after the party! Need a signature drink? Try these super cool Irish Flag Shots, they’ll get the party going! 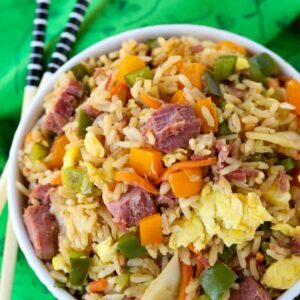 Looking For More Leftover Corned Beef Recipes? This super tasty nacho recipe is perfect for your St. Patrick’s Day party! No leftover corned beef? Head to your deli counter and grab some! Heat the oil in a heavy, deep pot until no more than halfway full, it reaches 400 degrees. Slice potatoes 1/4″ thick on a mandoline slicer, or carefully with a sharp knife, then place in a bowl of water to soak for 15 minutes. Drain the potatoes and dry very well with paper towels. Water will make the oil splatter so the potatoes must be dry. 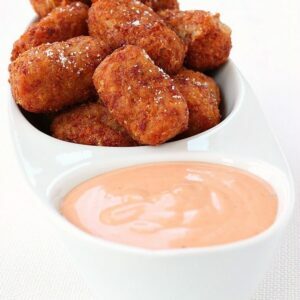 Once the oil comes to temperature, fry the potatoes in batches for 5-7 minutes until golden brown. Remove the potatoes to a paper towel lines baking sheet, then lightly season the potatoes with salt while hot. Repeat with the remaining potato slices. Place the fried potatoes onto a sheet pan and layer with the corned beef, cabbage and cheese. Top with sprouts and serve. Thanks Shelly, we should have had you back over for them! 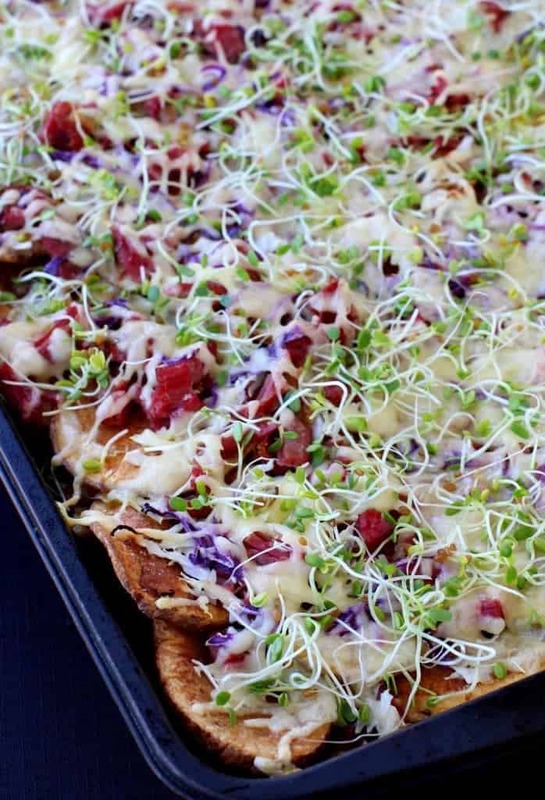 You can use alfalfa sprouts or whatever kind is at your market!